Since its launch, Community Insight’s users have had the ability to generate detailed reports on areas with a few clicks of the mouse. Many have told us this has transformed the way that they considered the neighbourhoods they work in (and those where they are considering working): rather than having to make a business case for commissioning a consultant to produce a report on a neighbourhood, typically costing £2000-£3000, within 10 minutes you can have 50 page reports on several neighbourhoods, and you can generate as many of them as you wish. As housing providers have been making more and more use of these reports, we have upgraded the feature to give users more control over the reports. In November we upgraded the functionality to allow you to request updated reports for an area, making it easier to produce an up-to-date profile of an area using the latest reporting template. Recognising that you might not want to lose access to old reports, we set this feature up so that the new report does not over-write the existing one. Following that upgrade we have now further enhanced the reporting features to allow you to delete reports you no longer want to see on the system. This latest upgrade means that you can create as many reports as you want, safe in the knowledge that you will not be overwhelmed with them and, of course, if you want to keep hold of a copy in your archives you can download them to your own system before deleting them. Following a successful testing period for users on our beta site, we have just launched a new feature for Community Insight to make it even easier to examine your different neighbourhoods. Community Insight users can now create their own custom categories to group their neighbourhoods. As with many of the other features of Community Insight, this has been designed to be flexible so you can use it in the way that makes most sense for your organisation: we do not predefine the categories or place constraints on how they should be used. You could use them to group together different types of areas (e.g. having a category for all of your housing management areas) or to categorise geographically – it’s entirely up to you. The system has already been updated to use the categories to organise the drop-down selection of areas on the map page, the dashboard chart page filter of areas and your list of reports. There will soon be further upgrades to also use the categories on the matrix dashboard view and the ‘My Patch’ functionality. Following the Land Registry making price-sold data available, we have now added to Community Insight a range of house price indicators. We have taken the Land Registry’s data for individual transactions and mapped them as average prices in each geographical area, averaged over a 12-month period. Users can find these new indicators amongst all the rest of the data that are available for mapping, within the housing theme. The addition of house price data was prioritised by the Community Insight user group; housing providers are keen to make use of this exciting new source of Open Data to gain another important set of insights into the areas where they work. As well as these new datasets that you have access to, as ever we have been keeping the data in Community Insight up to date with the latest releases of various indicators, including this month updates to several benefits datasets. 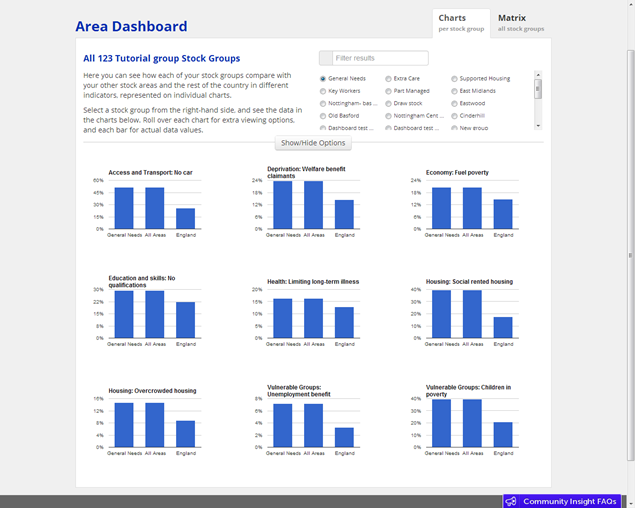 Community Insight recently gained a pair of dashboard features, giving users a powerful new way to visualise some of the key indicators across their neighbourhoods. The Matrix view gives Community Insight users a quick way of comparing each of the neighbourhoods they have defined on the system against a selection of indicators. 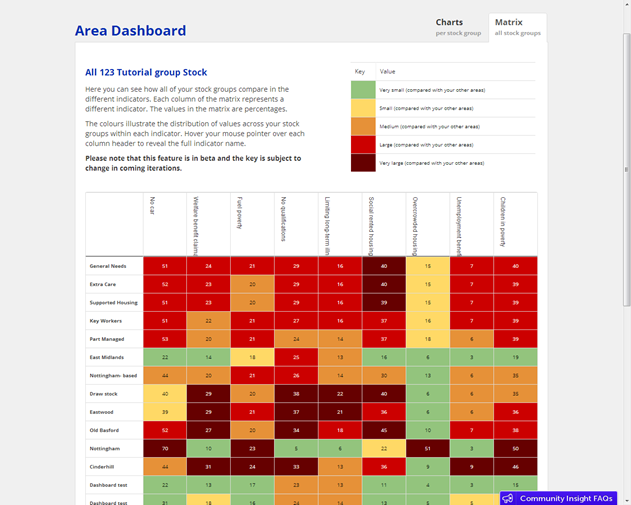 At a glance you can see which of your areas are highest and lowest across the range of indicators, helping you to identify priority neighbourhoods that are experiencing multiple hardships. The other new screen gives Community Insight subscribers a quick view of a particular area. By looking at the series of charts you can easily identify those indicators for which an area is particularly high or low when compared to your other areas or to the national average, helping you to select the type of activity that might be most valuable in that area.